Alcohol BreathAnalyzeris the most common method of testing for blood-alcohol content in use today. breath analysers estimate the concentration of alcohol in the body by measuring the amount of alcohol exhaled from the lungs.The hand held analysers have digital display, these are easy to use and provide accurate readings.The device can also be connected to the computer for logging data and a compact sized printer to print out the details of alcohol concentration, date and time. Now a days, Alcohol Breath Analysersare widely used by Traffic Police, Industries, Railways, Airports & Airlines, Military, Factories & Offices, Hotels & Restaurants, BPOs, MNC’s,Security companies, Bus & Taxi operators, Educational institutions, laboratory, Personal, etc. We offer a wide range of alcohol breathanalysersas per your requirements. 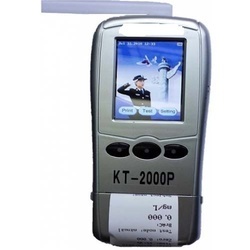 Product Description:-Alcohol KT-4000P has Electrochemical/Fuel cell sensor, Quick and precise analysis, built-in printer, 2.8" display touch LCD,20000 memory with rechargeable. This data can be downloaded to a printer or PC. 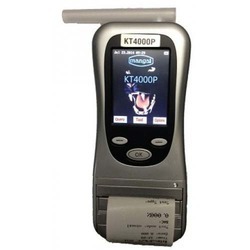 KT-4000P offers professional users precise and quick breath alcohol analysis in a user-friendly and compact form. Thanks to its wide range of possible configurations the hand-held instrument can be easily. Easy to read display Alcohol readings are clearly shown on a 2.8 inch LCD screen. Memory capacity able to store 20000 test results This data can be downloaded to a printer or PC. Mouthpiece Specially designed one-way mouth piece with non-return valve. 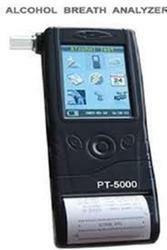 Breath Alcohol Tester,KT-8000P is a fuel cell ,designed and intended for use in various applications. With its UK made electrochemical sensor, KT-8000P provides users accurate and rapid testing performance at a fair price. printed or downloaded to a computer. 5.Both active and passive blowing mode available. 6.Compact, portable and easy to use. 7.Power Supply: Nokia BP-6M rechargeable li-ion battery. 8.Built-in clock IC and an individual battery for the clock always secure correct time. 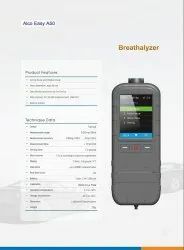 Product Description :Breath Alcohol Analyzer Inbuilt Camera is primarily devised for Traffic police so as to penalise drunken drivers and law enforcers. 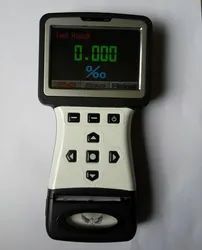 Being a reliable manufacturer and supplier, we ensure complete precision in all its features, connectivity and functionality to ensure accurate determination of blood alcohol content. It is available in two different models, Alcohol Tester PT-331 Inbuilt Camera and Breath Analyzer KT-6000C, Camera Model as per the suitability and application. The primary feature of this device is its inbuilt printer to print the results as a proof for alcohol consumption of the tested person. Dual Display: Color display with touch panel. (with smart Phone display). Quick and precise analysis: Ensure a high sensitivity to alcohol and stable & reliable working life. Data download: PC down via USB port. Mouthpiece: Easy to replace a new mouthpiece by pressing a key, patented convenient and hygiene. Power supply: Rechargeable 7.4V Li-ion battery. Auto flow monitoring: Flow detect automatically. Display range: 0~0.4% BAC or 0~4.0â€°BAC or 0~2.0mg/l. Long Term Storage condition: Temperature: 0 Degree C to +55 Degree C..
Humidity: 30 to 90% RH. Operating Temperature: From -20â„ƒ to +45 â„ƒ, ( 5â„ƒ to +40 â„ƒ for optimum operation). Measurement precision: Standard deviation +/â€“0.025 mg/L or +/â€“5 % of the measurement. â€œDrift: typically < 0.8 % of the measurement value/month â€œ. Data management software: Can export the files as Microsoft Excel documents directly. Product Details :Never again have a doubt about how much alcohol you have had to drink or whether you or your friend is legally OK to drive. This mini breathalyzer has a traffic light readout style system making it super easy use. Simply blow for 5 seconds then wait. A green indicating light and you are good to go; yellow and you may want to wait a while before you go home; while red indicates you should hand your keys to a friend. This is great reference tool for seeing if you have had just a little too much to drink. Chinavasion offers this car safety device with a factory-direct wholesale price, so buy in bulk now and watch your reselling profits soar! Condition Humidity : 20-98% r.h. Product Description : Alcohol PT5000P alcohol breath analyzer is a fuel cell porous disk with a thin layer of platinum black on both faces and any electro chemical alcohol that comes in contact with the cell's surface is broken down chemically.For each/ Fuel Cell molecule of alcohol that is broken down a given number of electrons are freed during the process. The numbers of electrons generated are in proportion to the amount of alcohol. 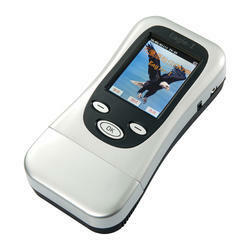 Display has Color 3.2" TFT LCD white touch screen Inbuilt or detachable printer. Navigating key input with Touch Panel, PC down via standard USB cable and able to store 12,000 test results (Depends on data required or Flash capacity). Electrochemical/ Fuel CellSensor:The fuel cell is a porous disk with a thin layer of platinum black on both faces and anyalcohol that comes in contact with the cell's surface is broken down chemically. For each molecule of alcohol that is broken down a given number of electrons are freed during the process.The numbers of electrons generated are in proportion to the amount of alcohol. Printer: In-Built printer -Can be detached from alcohol analyzer and become a stand alone wireless. Analysis Ensure a high sensitivity to alcohol and stable & reliable working life. Datadownload:PC down via standard USB cable. Environment:: -40 Degree C to 85 Degree C.
Breath Alcohol Analyzer offers professional users precise and quick breath alcohol analysis in a user-friendly and compact form. Thanks to its wide range of possible configurations, the hand-held instrument can be easily adapted to meet different measurement results can be obtained within a very short period of time international regulations and guidelines. KT-2000P offers professional users precise and quick breath alcohol analysis in a user-friendly and compact form. Thanks to its wide range of possible configurations, the hand-held instrument can be easily adapted tomeet different measurement results can be obtained within a very short period of time.international regulationsand guidelines. 8.Easy to read display Alcohol readings are clearly shown on a 2.8 inch LCD screen. 10.Memory capacity Able to store 15,000 test results This data can be downloaded to a printer or PC. 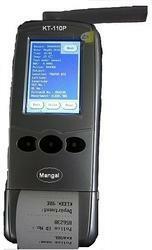 Product Description: Law Enforcement Alcohol Tester with Electrochemical / Fuel Cell Sensor. Display :Big 3.5" (320*480) touch screen LCD with graphic waveform animation. Data download:PC down via USB port. Mouthpiece:Easy to replace a new mouthpiece by pressing a key, very convenient and hygiene. Measurement precision:Standard deviation +/â€“0.025 mg/L or +/â€“5 % of the measurement Drift: typically < 0.8 % of the measurement value/month. Temperature: 0 Degree C to +55 Degree C..
Data Management Software : Can export the files as Microsoft Excel documents directly. Advanced self-calibration:Manually parameters adjust available. 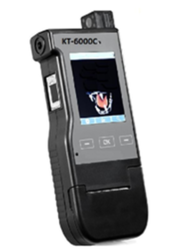 KT-2000P offers professional users precise and quick breath alcohol analysis in a user-friendly and compact form. thanks to its wide range of possible configurations, the hand-held instrument can be easily adapted to meet different measurement results can be obtained within a very short period of time.international regulations and guidelines. Because KT-4000 offers intuitive operation, its easy to use and precise. Electrochemical/Fuel cell sensor Highly specificity to alcohol, unaffected by other possible breath contaminants. Compact gas circuit design and advanced analysis process Assure fast, accurate and stable testing results. Quick and precise analysis this ensures a high specificity to alcohol, with a long and stable working life. Built-in printer Can be detached from main body and be replaced by a piece of spare lithium-ion cell. Fast printing process 5 cm per second. Color LCD touch screen High resolution. All measurement functions are controlled via a single key, while menu navigation is by three menu keys. Touch screen For easy input of information. Memory capacity Able to store 15,000 test results This data can be downloaded to a printer or PC. Power supply rechargeable lithium-ion cell able to work for twenty hours. Big capacity RTC-BATT Can be replaced easily. Mouthpiece Specially designed one-way mouthpiece with non-return valve. Product Description :KT-6000C offers professional users precise and quick breath alcohol analysis in a user-friendly and compact form. Thanks to its wide range of possible configurations, the hand-held instrument can be easily adapted to meet different measurement results can be obtained within a very short period of time.International regulations and guidelines. Because KT-6000C offers intuitive operation, it’s easy to use and precise. Electrochemical/fuel cell sensor, highly specificity to alcohol, unaffected by other possible breath contaminants. 3.2 inch 240X320 TFT LCD touch screen provides intuitive operation. Memory capacity, storage can be transferred to PC data manage software in real time through 3G (GPRS) network enable real-time monitoring.(Optional). Three buttons simple test operation system. Two testing modes: evidential and screening. Built-in thermal printer/built-in Dot Matrix printer. (Optional). Large battery capacity, ensure 24 hours of Continuous work. Mouthpiece can be automatically ejected.